The Americans with Disabilities Act (ADA) was implemented in 1990 to eliminate discrimination toward people with disabilities. Business owners must follow ADA guidelines or they could be hit with an ADA compliance violation, which isn’t a fun situation for anyone involved. 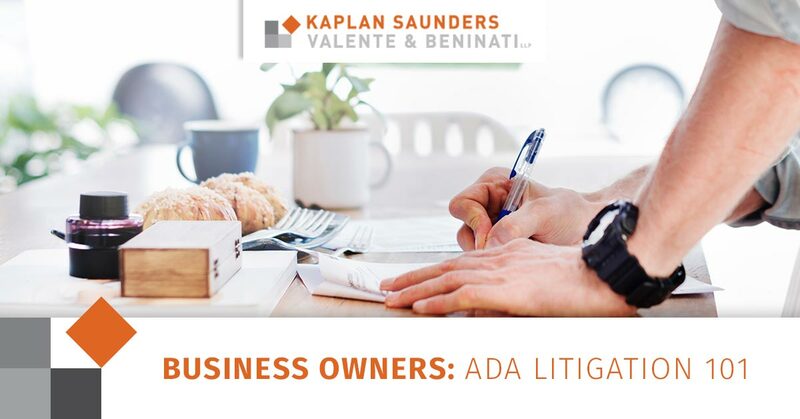 We know business owners try to adhere to these guidelines but don’t always know the ins-and-outs of them, so if you need help developing ADA-compliant operational policies, practices and procedures, give Valente Law a call today! What exactly is ADA Litigation? Employment. This section allows those with disabilities access the same employment opportunities and benefits that are available to those without a disability. Public Services: State and Local Government. This section prohibits discrimination on the basis of disability by public entity agencies. Public Accommodations and Services Operated by Private Entities. This section prohibits places of public accommodation (including privately owned facilities) from discriminating against those with disabilities. Telecommunications. This section requires phone and internet companies to provide accommodations that allow individuals with hearing or speech disabilities communicate over a telecommunication medium. Miscellaneous Provisions. This section defines what is not a disability among a variety of other topics. If a disabled person feels as if they have been discriminated against regarding any of these sections, they can pursue legal consequences. About 56.7 million people in the United States have a disability — 19 percent of the population. Remember each of these people are a potential client. There are three main things a plaintiff must prove if they feel a business has discriminated against them. They do, in fact, have a disability. The ADA defines a person with a disability as a person who has a physical or mental impairment that substantially limits one or more major life activity. The business is a place of public accommodation. They were denied equal treatment because of their disability. This includes any “architectural barriers” that make it difficult for disabled people to properly engage with the business, such as too high of a counter height or the absence of a handicap ramp. Those with disabilities have a variety of ways to file for a lawsuit regarding an ADA violation. They can either take the case to federal court and obtain court orders to stop ADA violations or they can file a complaint with the Department of Justice. The DOJ then can take action to resolve the complaint, which may include an investigation. Attorney Charles Valente is well-versed in the ADA litigation, thanks to decades of hands-on experience. His goal is to provide a simple, organized and comfortable approach for his clients to help them with whatever ADA business dispute they may have. If you’re in need of a great business dispute and litigation attorney, give Charles Valente at Valente Law a call today at (312) 832-7890 or fill out an online request form to schedule an appointment.